We’ll be updating you throughout the day with essential breaking news, data alerts, earnings reports and all the major market movements. Draghi says today's statement and his comments from Sintra are not very different. He says the factors holding back inflation will last for some time and are not permanent. Draghi says his comments on reflation just means the concerns of deflation have been replaced with hopes for inflation. He says the council trusts the strength and power of its monetary package. ECB President Draghi is answering questions from CNBC's Annette Weisbach. He says he is confident that the programme can continue smoothly. On the topic of buying Greek government debt, he says it is up to the Greek government to tap the markets with a bond issue and adds that there has been serious progress in Greece in last several months..
Mario Draghi says the ECB will "first and foremost look at inflation in Autumn decisions." He says if we experience unwanted tightening of conditions, then the central bank would have to act. Draghi reveals he has not tasked staff with preparing options for exiting the QE programme. He says the governing council has not discussed what is going to do in September and beyond. They don't want to set dates, they want to think and gather data. He says it does not want to make decisions in the absence of data. Mario Draghi is answering a question on inflation. Draghi says the reasons for central banks around the world to adopt a 2 percent inflation target are still valid. He says the monetary policy measures have produced very positive effects, even if they haven't achieved their inflation target. Also, he says the ECB has not discussed increasing purchases of corporate bonds and other alternatives, but retains the flexibility to do so. Timothy Graf, head of macro strategy at State Street Global Markets, says the dovishness of the ECB and Mario Draghi today comes as a surprise. Below-target inflation always meant tight policy was a long way off, but some hint of extraordinary easing measures coming to an end was a reasonable expectation given the strong tone to Eurozone data. European markets should like the news and we look for the recent underperformance of peripheral bonds to reverse. The trade-weighted euro also has ample room to test lower and retrace a portion of its 5 percent gain over the last quarter. Brendan Lardner, senior portfolio manager for global active fixed income at State Street Global Advisors, also weighed in, saying today's meeting unwound some of the hawkish commentary made at the Sintra forum in June. While Draghi had raised the prospect of potentially removing some extraordinary policy measures in the not too distant future, today’s meeting seems to have again focussed on the subdued inflation pressures in the Eurozone and the need for ongoing policy support. The ECB will have also been cognisant of the downward pressure an ongoing rise in the euro could have on future inflation readings. While the ECB waits for more data to support a tapering of asset purchases, risk assets should receive some support while the recent strength of the euro has scope to correct somewhat. 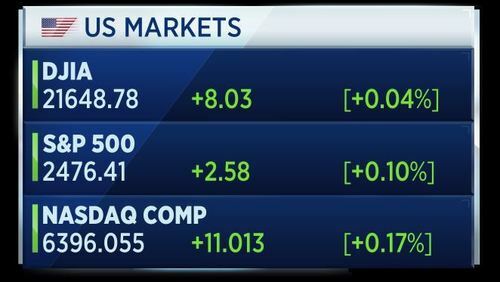 U.S. markets are now open, building on yesterday's strong session. The markets open to the upside. The Dow is flat today, down around 10 points. Here are the stocks weighing on the index. Nike shares top the index after analysts at Morgan Stanley predicted growth to accelerate in the coming months. At the bottom of the income is Travelers, which disappointed after reporting its Q2 core income and core return on equity was impacted by high levels of catastrophe and non-catastrophe weather-related losses. Microsoft shares are also down; it is due to report its latest results after the bell. The U.S. June leading economic indicators index rose 0.6 percent to 127.8. It was expected to rise by 0.4 percent. This is the best reading since January. To get a better reading than 0.6 percent you have to go back to December 2014. The U.S. Senate Judiciary committee has approved Chris Wray's nomination to be FBI director. 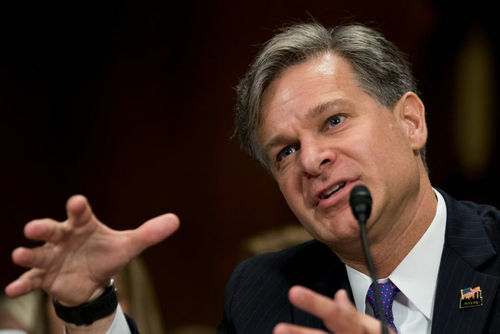 The panel has unanimously advanced Wray's nomination. This vote clears the way for Wray to be confirmed in August by the full senate. The European Central Bank was widely expected to keep interest rates unchanged. 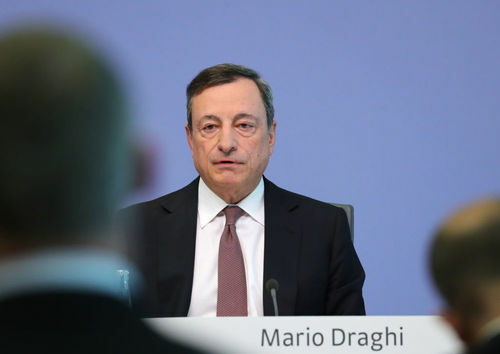 However, markets were interested to see its language on tapering the QE programme and in that regard the ECB remained steadfast, with President Mario Draghi saying they had not discussed it and would not until some time in the Autumn. Commerzbank analyst Ralph Solveen says they had expected the ECB to take steps towards normalising its monetary policy, but it did not. It has left its forward guidance unchanged and there were cosmetic changes at most to President Draghi’s statement. We see in this the ECB’s desire to keep as much flexibility as possible for as long as possible. We still expect it to announce a reduction of its bond purchases for the beginning of 2018 at the next meeting in September. Solveen added that Draghi's language was effectively unchanged from the last meeting 6 weeks ago. The central bank once again stressed its readiness to not only prolong but also expand its bond buying if need be. According to Draghi, there was unanimous agreement on this. The same applies to the decision not to announce a date for reviewing the further course of action regarding QE. The staff was not even asked to look at the options here. And the statement read out by Draghi essentially matched what was said six weeks ago. The only halfway relevant change was the comment that the recovery is not only strengthening but also broadening. Elon Musk has announced his tunnelling company The Boring Company has permission to build an underground tunnel for the hyperloop. The hyperloop is an innovative transportation system that can potential travel at 700mph. U.S. leading economic indicators rose 0.6 percent in June, above consensus expectations of 0.4 percent. Ian Shepherdson, chief economist at Pantheon Macroeconomics, says the data was boosted by a rebound in building permits. The index overshot the consensus because most forecasts were made before the release of the very strong building permits numbers yesterday. The jump in permits alone added 0.21% to the index, though note that seven of the other nine components of the index also made positive contributions. The LEI has understated growth in the past couple of years because it overweights manufacturing, which suffered disproportionately as oil sector capex collapsed, but it should soon become a more reliable indicator as the hit fades. For Q2, the index is consistent with GDP growth of about 2%; we look for 3.0%. Our core LEI-X3 measure, which ignores the yield curve, ISM orders and the Conference Board's proprietary credit conditions measure, signals 3% growth. Most of the major European markets finish lower after the ECB's latest press conference led to the euro rising 1 percent against the dollar. The FTSE 100 finished up around 0.8 percent; sterling dropped 1.4 percent against the euro, which boosts the returns for U.K. companies which receive earnings from abroad. Tech, media and household goods were the only sectors of the Stoxx 600 to record gains. We'll close the blog there. In the U.S. keep an eye for earnings from eBay, Microsoft and Visa. Join us tomorrow when we report on even more U.S. earnings, including Colgate-Palmolive, General Electric and Autoliv.